Lord God, today we pray about the mystery surrounding Canadian diplomats growing suspiciously ill in Cuba. 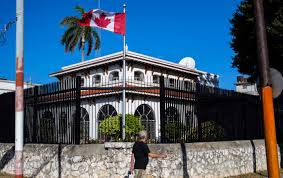 There are so many concerns: the diplomatic staff representation at the Canadian embassy in Cuba being halved, the possibility of foul play, the possibility that this is simply illness and making Cuba look unnecessarily bad, relations between the two nations, how other nations might be impacted, the effect on travel to Cuba, etc. We are thankful you see all of these concerns and are sovereign over them. We lay these concerns before you, trusting you to take care of them in whatever ways seem best. We do pray for these diplomats who have grown so ill in recent months. We pray for doctors to discern the cause of these troublesome symptoms and for these diplomats to receive the care they need. We pray that they will find other jobs that will provide for them and their families, and for them to readjust to life back in Canada or wherever else they end up after this season in Cuba. Bring truth to light in your perfect timing. Draw people closer to you through this trial. In Jesus' name we pray, amen.